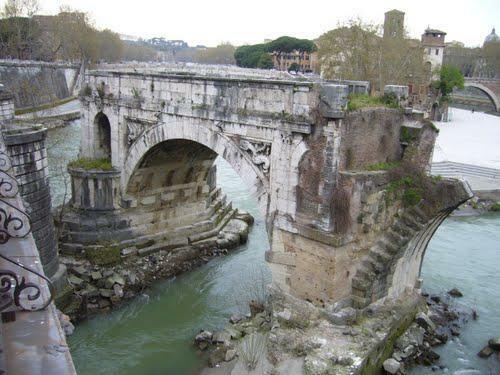 The bridge section in the photo above is all that remains of the Ponte Rotto, one of the most ancient bridges in Rome, and the first stone bridge erected there by the Roman engineers. The shoreline on either side is inaccessible but from its’ top you get a great view of the moment. As Linda and I stood there pondering this antiquated rock pile the words of a song came to my mind. ‘The past is past and tomorrow is not here – only what we do for Jesus today will last.’ It’s not the best of lyrics but it does carry a point. Yesterday is gone and no retrieval of its’ opportunities is possible. Yesterday has been written and the ink is dry. Tomorrow is yet to be. I assume it will come but it may not. I may not lean forward to catch a glimpse, nor does a hint of tomorrow come like the first blush of sunrise, long before the rising. God has designed our lives in such a way that we live in the present moment. Really, faith is not possible under any other circumstance. I am called to entrust my past to God, to believe that it has been carried up into His forgiveness. In a similar way I entrust tomorrow to God’s purpose and look forward in hope. Both directions are inaccessible to me as I live between the already and the not yet. So here we are at the threshold of a new and untried day. Like someone peering out from the vantage point of that ancient bridge, we have one option, to breathe in the moment and take hold of this day. For people of faith today is enough. Nice insights. Sometimes I think I have faith in God for my future, but not in the moment. Inconsistent, I know. Thanks for the reminder that HERE and NOW is where he’s at work. I’m inconsistent, when I’m at my best!